Personal Best Tee & More. I got this top today (TTS) and I really love it. I got it in Lolo but I’m thinking of keeping the tags on because I really want a new color in it as I have way too much purple now. It’s quite comfortable and looser fitting than a swiftly so it doesn’t show flaws like a swiftly. I love the grey detailing around the boatneck and at the bottom hem. As requested, a picture of my personal best SS. Sorry, my camera has a dead battery and had to use my crappy cell phone camera. I would judge this top based on the picture above. The top is a size 8 and it’s looser around the middle than my picture bellow indicates. Lifting my arms stretched it out a bit. With my arms down at my side it pools a little bit (not as much as above) which I really like. 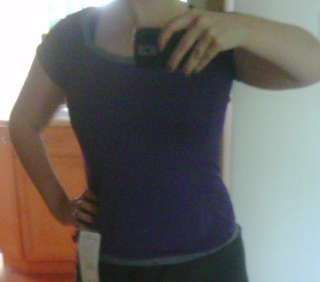 This top I think would look great with jeans as well as for running. I love how the staps on on my Free2be bra show for casual wear, and my flow y straps looks cute too, but if your using something like the Ta Ta Tamer it may not look so cute. Something to keep in mind. Alignment pant front pocket. It’s huge! Run: Reflection Pullover. I hated this on. I felt it was very, very short. And I don’t mind crop jackets. And I hated the sleeve with the black glove look and then poofyness right bellow the elbow. No great pockets either. The reflection on the back is pretty good though and I really wish I’d liked this pullover. I tried the Run: Inspire Jacket on today and a size 8 was way too small. I think this is a size it up jacket because I can easily wear an 8 up top and sometimes smaller and for it to be that tight it was not even a possibility with just a swiftly under it. All of the tightness was in the shoulders and chest.